This post represents Part II of a two-part series on the disclosure of the asteroid belt. The revelations continue to shock and amaze audience members. However, by all appearances, the show is only just getting started. Enjoy. The recent disclosure by the scientific establishment regarding the ancient history of the asteroid belt was by far, one of the most surprising official disclosures to date. According to sources, the true history of the solar system was a highly guarded secret at one point in time. Yet now, it appears to be one of the many nuggets of truth being slowly unveiled by a historically secretive institution. In the last post, we discussed the recent disclosure of the asteroid belt in our solar system being much more than what mainstream astronomy has been willing to consider until now. These astronomers now claim that there is a possibility that the asteroid belt may have once been a number of planets which were somehow destroyed. The fragments of these planets are now believed to comprise the belt between Mars and Jupiter. The strange part about this supposedly new discovery was that it comes particularly late in comparison to the numerous disclosures we have received in the past. According to theories predated the recent MSM disclosure, the belt used to be a large rocky planet which had Mars as one of its satellites and resided between Earth and Jupiter. This theory claimed that the planet was somehow destroyed and its components, scattered throughout the solar system. The theory was described in a scientific proposal titled the Exploded Planet Hypothesis, which has existed for a number of years now. What we might find interesting is the fact that this well-known hypothesis was never mentioned in the previously reviewed article by Business Insider. Upon seeing this, we might ask ourselves, "Why would a supposedly complete and thorough article from a mainstream news source fail to mention the previously existing studies on the exact same subjects they are supposedly interested in covering? We cannot say for certain. However, we can examine the proposal and make our own assessment. This is the website, Biblioteca Pleyades, with the story. In the latter half of the 18th century, when only six major planets were known, interest was attracted to the regularity of the spacing of their orbits from the Sun. The table shows the Titius-Bode law of planetary spacing, comparing actual and formula values. This in turn drew attention to the large gap between Mars and Jupiter, apparently just large enough for one additional planet. Today we know of tens of thousands of “minor planets” or asteroids with planet-like orbits at that average mean distance from the Sun. With the discovery of the second asteroid in 1802, Olbers proposed that many more asteroids would be found because the planet that belonged at that distance must have exploded. This marked the birth of the exploded planet hypothesis. It seemed the most reasonable explanation until 1814, when Lagrange found that the highly elongated orbits of comets could also be readily explained by such a planetary explosion. That, unfortunately, challenged the prevailing theory of cometary origins of the times, the Laplacian primeval solar nebula hypothesis. Comets were supposed to be primitive bodies left over from the solar nebula in the outer solar system. This challenge incited Laplace supporters to attack the exploded planet hypothesis (eph). Lagrange died in the same year, and support for his viewpoint died with him when no one else was willing to step into the line of fire. In the 1860s, Simon Newcomb suggested a test to distinguish the two theories of origin of the asteroids. If they came from an exploded planet, all of them should reach some common distance from the Sun, the distance at which the explosion occurred, somewhere along each orbit. But if asteroids came from the primeval solar nebula, then roughly circular, non-intersecting orbits ought to occur over a wide range of solar distances between Mars and Jupiter. Newcomb applied the test and determined that several asteroids had non-intersecting orbits. He therefore concluded that the solar nebula hypothesis was the better model. Newcomb’s basic idea was a good one. But only a few dozen asteroids were known at the time, and Newcomb did not anticipate several confounding factors for this test. Because Newcomb didn’t realize how many asteroids would eventually be found, he didn’t appreciate the frequency of asteroid collisions, which tend (on average) to circularize orbits. He also did not appreciate that planetary perturbations, especially by Jupiter, can change the long-term average eccentricity (degree of circularity) of each asteroid’s orbit. Finally, Newcomb did not consider that more than one planet might have exploded, contributing additional asteroids with some different mean distance. In Newcomb’s time, no evidence existed to justify these complications. one near the present-day orbit of Mars. This article will review that evidence. Where Did All the Mass Go? Although over 10,000 asteroids have well-determined orbits, the combined mass of all other asteroids is not as great as that of the largest asteroid, Ceres. That makes the total mass of the asteroid belt only about 0.001 of the mass of the Earth. A frequently asked question is, if a major planet exploded, where is the rest of its mass? Consider what would happen if the Earth exploded today. Surface and crustal rocks would shatter and fragment, but remain rocks. However, rocks from depths greater than about 40 km are under so much pressure at high temperature that, if suddenly released into a vacuum, such rocks would vaporize. As a consequence, over 99% of the Earth’s total mass would vaporize in an explosion, with only its low-pressure crustal and upper mantle layers surviving. The situation worsens for a larger planet, where the interior pressures and temperatures get higher more quickly with depth. In fact, all planets in our solar system more massive than Earth (starting with Uranus at about 15 Earth masses) are gas giants with no solid surfaces, and would be expected to leave no asteroids if they exploded. Bodies smaller than Earth, such as our Moon, would leave a substantially higher percentage of their mass in asteroids. But the Moon has only about 0.01 of Earth’s mass to begin with. In short, asteroid belts with masses of order 0.001 Earth masses are the norm when terrestrial-planet-sized bodies explode. Meteorites provide direct evidence for this scenario of rocks either surviving or being vaporized. Various chondrite meteorites (by far the most common type) show all stages of partial melting from mild to almost completely vaporized. Indeed, it is the abundant melt droplets, called “chondrules”, that give chondrite meteorites their name. Two important lines of evidence that asteroids originated in an explosion are the explosion signatures (described later in this article), and the rms velocity among asteroids, which is as large as is allowed by the laws of dynamics for stable orbits. In other words, the asteroid belt is certainly the remnant of a larger population of bodies, many of which gravitationally escaped the solar system or collided with the Sun or planets. (1) The most common meteorite type, chondrites, have all been partially melted by exposure to a “rapid heating event”. Other asteroids show exposure to a heavy neutron flux. Blackening and shock are also common traits. (2) The time meteoroids have been traveling in space exposed to cosmic rays is relatively short, typically millions of years. Evidence of multiple exposure-age patterns, as would happen from repeated break-ups, is generally not seen. Comets are so strikingly similar to asteroids that no defining characteristic to distinguish one from the other has yet been devised. This is rather opposite to expectations of the solar nebula hypothesis, because comets should have been formed in the outer solar system far from the main asteroid belt. But it should be noted that galactic tidal forces would eliminate comets from any bodies that exploded prior to 10 Mya, so only very recent explosions can produce comets that would remain visible today. Figure 1. Saturn’s black-and-white moon Iapetus. A major explosion would send a blast wave through the solar system, blackening exposed, airless surfaces in its path. 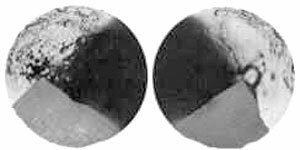 Most such solar system surfaces are indeed blackened, even for icy satellites. But a few cases have such slow rotation that only a little over half of the moon gets blackened. Saturn’s moon Iapetus is one such case, because its rotation period is nearly 80 days long. Figure 1 shows a spacecraft image of Iapetus. One side is icy bright; the other is coal black. The difference in albedo is a factor of five. Gray areas are extrapolations of black areas into regions not yet photographed. As such, they represent a prediction of what will be seen when a future spacecraft (Cassini?) completes this photography. Perhaps the most basic explosion indicator is that all fragments of significant mass will trap smaller nearby debris from the explosion into satellite orbits. So explosions tend to form asteroids and comets with multiple nuclei of all sizes. Collisions, by contrast, normally cannot produce fragments in orbits because any debris orbits must lead either to escape or to re-collision with the surface. Moreover, collisions tend to cause existing satellites to escape, leading to asteroid “families” (many of which are seen). Our prediction that asteroids and comets would often be found to have satellites has been confirmed in recent years. Over 100 additional lines of evidence related to the eph and the standard models it would replace are summarized in [iii]. Did More Than One Planet Explode? Many lines of evidence suggest more than one planetary explosion in the solar system’s history. The discovery of one, and probably two, new asteroid belts orbiting the Sun beyond Neptune is especially suggestive, given that the main asteroid belt is apparently of exploded planet origin. 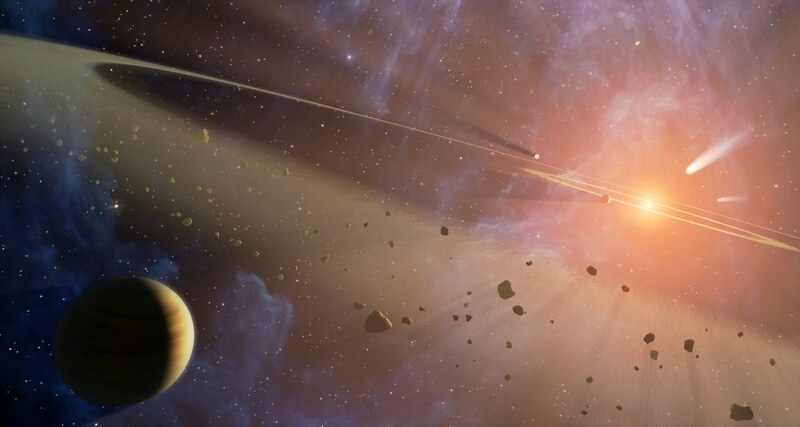 Evidence of the “late heavy bombardment” in the early solar system is another strong indicator. These points are discussed later in this article. On Earth, geological boundaries are accompanied by mass extinctions at five epochs over the last billion years. Two of the most intense of these, the P/T boundary about 250 Mya, and the K/T boundary (and the extinction of dinosaurs) at 65 Mya, are the most likely to be associated with the damage to Earth’s biosphere expected from a major planet explosion. Meteorites provide direct evidence about their parent bodies. Yet this evidence strongly indicates at least 3-4 distinct parent bodies. Oxygen isotope ratios are generally similar for related planetary bodies, such as all native Earth and Moon rocks. These ratios for meteorites require at least two distinct, unrelated parent bodies, and probably more. Cosmic ray exposure ages of meteorites indicate how long these bodies have been exposed to space, because cosmic rays can penetrate only about a meter into a solid body. Collisional break-up can reset the exposure ages for some meteorites, and produce “double exposure” or other complexities for others. The data show clusterings of exposure ages around several different primary epochs, suggesting multiple explosion epochs. Main belt asteroids come in many types, but most of these are sub-type distinctions. 80% of all main belt asteroids are of type C (“carbonaceous”), and most of the remaining 20% are of type S (“silicaceous”). The former are found predominately in the middle and outer belt, while the latter are mostly in the inner belt, the part that lies closest to Mars. These two types are unlikely to have had the same parent body. That parent body mass is almost certainly less than the size of our Moon, because the carbonaceous meteorites most closely associated with comets indicate a parent body that was too small to chemically differentiate. If we know anything about the late Dr. Tom Van Flander, we will know that he was most definitely no slouch. Nor was his name or title small by any stretch of the imagination. Thomas Van Flander, Ph.D. was a professional scientist and served as the chief astronomer at the U.S. Naval Observatory in Washington, D.C. There, he studied the various aspects of the night sky which most astronomers might simply take for face value. Van Flander specialized in lunar cartography, the physics of natural satellites, and the overall history of the solar system. He developed many theories which were clearly valued by the United States Navy, making it clear that many interests took his work particularly seriously. Dr. Van Flander's work was extensive, and his title was highly notable in the scientific community. Yet, for some odd reason, Business Insider did not apparently believe that this exhaustive amount of professional expertise needed to be included within their article, even when their own article confirmed the legitimacy of his work. By all appearances, this does not make sense. It is from studies like those of Dr. Van Flander that we learn about the neglected side of pertinent science. Up until this point, these weighty studies and theories have not received their much-deserved attention, but have instead, been brushed aside as ridiculous and inconsequential. Why? Naturally, if a scientific establishment were to avoid researching some of the most interesting areas of study, there would have to be an extremely good reason to forgo the hard-wired curiosity of the average scientist. According to research, this discouragement of delivering thorough scientific study is typically achieved through fear, ridicule, and the threat of ostracization by the rest of the scientific community. One does not even need to speculate upon these possibilities, as the open ridicule can still be seen within some media outlets. This common trend of informational control can be seen on online platforms such as Google, YouTube, and multiple publishers, as these organizations appear intent upon discouraging all truth-seekers from looking any further into the subjects of the unknown. In general, however, the major sources of censorship are reported to be Western scientific publishers. By observation, it appears that the trend of blanket ignorance among scientific publishers seems to be ending. However, according to extensive observation, it seems that anyone who attempts to advance this throttled narrative faster than the pace of the established media will be ridiculed. It is as though various figures behind the media are only interested in delivery limited amounts of information, and even though the information they do reveal can be easily extrapolated upon, the ridicule does not seem to stop. We might note that even though Dr. Van Flander was highly recognized, the fact that he opposed the scientific dogma of the day seemed to make the rest of his accomplishments largely worthless in the eyes of the mainstream scientific community. According to research, this unspoken and yet strict requirement of conformity is highly enforced within established science. This appears to be why up until this point, we have not heard Dr. Van Flander's hypothesis discussed by corporate sources. Nevertheless, people are far more intelligent than those behind the mainstream media appear to assume. We are more than capable of learning the truth without the need for any MSM overlord dictating half-truths to us. There is a growing mass of the population which no longer subscribes to the corporate media controllers behind the MSM. Yet still, the partial disclosure of seemingly obvious truths continues. We are aware of the strong likelihood that there is much more truth to be uncovered, and that multiple institutions are simply pretending as though they are announcing these various discoveries the moment they are made (as opposed to long after the fact). We are also aware of the fact that multiple whistleblowers have been saying the exact same thing for years as these MSM reports even before these official news reports came forward. It is because of the consistent way in which whistleblowers are able to predict future disclosures that many of us realize that we no longer need the informational crumbs of the corporate media in order to know the possibilities within disclosure narratives. Even still, it is good to see that to some degree, the rest of the media is catching up to the knowledge base of alternative communities. Discussions over the past decade have revealed a number of interesting possibilities with regard to the history of our solar system. These discussions include both mainstream scientific narratives as well as theories of alternative science and history. A growing number of researchers have come to the belief that the solar system was once inhabited by another race of beings that were far more advanced than humans presently are. There are a number of theories as to where these beings came from, but in general, the present orbit of the asteroid belt is thought to be the round-about location of where one of these groups originated. To add, that civilization is believed to be a distant relative of the human race. One of those who contributed a good deal to the discussion on theories of the ancient solar system was veteran, whistleblower, and experiencer, Corey Goode. Goode claims to have read an extensive amount of data from within the records of the Secret Space Program organization in which he served a number of decades back. These records included technical data, intel related to ancient myths, and verifiable science on a number of topics. Below is a section from one conversation in which Corey discloses the information he read and discussed during his service in the SSP branch known as Solar Warden. Goode goes on to state how SSP scientists were able to date many of the ruins found within the solar system to several tens of millions of years old. If this testimony represents the true history of our solar system, this is profound. We may note the fact that up until this point, the corporate media has been following the previously predicted script of partial disclosure which Goode originally claimed might occur. This partial disclosure narrative included revelations of the existence of a super-Earth-like planet, the eventual disclosure of ancient ruins in our solar system, the discovery of ET technology either on moons, on an asteroid/planetoid, or both. These predictions also included further disclosures of discoveries of multiple Earth-like planets located in distant star systems. We might be interested to find out that virtually every one of these disclosures has come forward from the corporate media, just as predicted. Here is more on the conversation. The classified project called Brilliant Pebbles is not a subject that is presently being discussed in many communities lately. In truth, we cannot yet verify whether or not this was actually a project which involved a significant amount of manpower to accomplish, or if it was merely a scientific exercise which utilized a group of supercomputers for a set period of time. Until there is more information available about this subject, it is still an open case. The fact that the conversation mentioned the concept with a proper noun seems to indicate that this was a joint process which likely involved multiple people, a significant amount of time, and a good number of supercomputers. To accurately calculate the mass and trajectory of several metric tones of space rock and debris over the course of millions of years is not a small endeavor. This task would likely require as many hours and as much dedication to the task as possible (though SSP technology might provide for a much quicker process). Consequently, it seems as though the endeavor should receive the appropriate prefix of Project. There are not many sources discussing the true possibilities of the history of our solar system. The Cosmic Disclosure series on Gaia has offered a good deal of these testimonies on the subject of cosmic history. There are only a handful of others which offer the same amount of cohesive data. It can be difficult to find textual references which describe an extra planet in the ancient history of our solar system. However, some of these concepts are discussed in the writings of author, Zecharia Sitchen. In a number of his books, Sitchen refers to a large rocky planet called Tiamat which occupied the present location of the asteroid belt. There is also some reference to the ancient history of the solar system within the Law of One text. This text claims that the enormous Earth-like planet called Maldek. This super-Earth had a moon that was actually the planet Mars. It is also possible that the other planetoids located within the asteroid belt composed the collection of satellites of this massive planet. However, these may have been captured moons from Jupiter which were commandeered either before or after the destruction of the super-Earth. According to the text, Maldek was actually inhabited along with the Martian moon. However, this planet was war-like toward the end of its existence and was at odds with the civilization on Mars. These civilizations are believed to have ended up destroying themselves completely, and this is what was said to be the disaster that created the asteroid belt. The explosion of this super-Earth is also believed to have destroyed the planet Mars, stripping it of its atmosphere, oceans, and decimated the once-thriving civilization there. An explosion this massive may have been the cause of the apparent scorching of lunar surfaces on a number of Jupiter's moons. To add, if a large planet was destroyed in such a way, the oceans of that planet may have been the actual origin of the comets which occupy our solar system. If so, a massive explosion may explain the presently erratic orbits of these comets. This story of the ancient history of the solar system suggests not only the possible origin of the asteroid field, but it also suggests that the ancient solar system was actually inhabited by highly intelligent and technologically advanced beings. Whatever the true explanation behind the asteroid belt is, we cannot presently say. All we know for certain is that we as a civilization have a lot to learn with regard to true history and our present state as a civilization. Most of us are not interested in waiting any longer for honesty from a reputably dishonest and partial establishment to hand us more half-truths. In our view, the wait ended years ago, and it's about time for the establishment to come clean.